God concluded His creation on the 6th day, after daily bringing increased order to the chaos (“without form and void”) at the end of each day. He pronounced His finished work, His One World Order as “very good” (vs. 31). Then in the realm of heaven – Lucifer one day basically declared “Not Thy will O God, be done, but my will be done” (ISAIAH 14:12-14; EZEKIEL 28:12-15). At that point, Lucifer was out of order; no longer submitted to God’s Unified World Order he started a different world order, a second world order, a new world order and conspired with other angels against God, and drew a third of them after himself (REV12:4). Upon the realm of earth – Lucifer then attempted to recruit the man, and his wife to his cause; when Adam and Eve ate the forbidden fruit, denying God’s will – they fell into sin and took on a sinful nature. Legally speaking, the human race would no longer be led by the steward of God’s choosing – Adam – but rather by Lucifer aka Satan, who at that time took on the title of “the god (ruler) of this new world order” (2 COR. 4:4). At the Tower of Babel, (GEN 11:1-9) this New World Order developed into a one world government and religion. God disbanded them by confusing their one world language, creating dozens of languages, and forcing people to group together into separate nations based on their common language. As the nations were dispersed, these people took with them the religion of Babylon, including what became known as “the mystery schools” and “esoteric societies” which kept the occult (meaning “secret” or “hidden”) knowledge throughout these thousands of years. ‘Harlot’ by biblical definition is a symbol of false religion (JER 3:1,6,8 and EZEK 16:15-16, and elsewhere). The “Mother of harlots” therefore would be the source, the origin that gave birth to all false religion and this includes the mystery schools as well: “MYSTERY” – the many schools of the occult. And she is riding (comfortably) on – the Beast!!? We even see these mystery schools in the books of Isaiah and Daniel (ISAIAH 2:6; 47:13; DAN 2:27; 4:7). By the Devil’s diabolical determination, this Plan which he has been building for thousands of years – like the brick and mortar of the Tower of Babel – will finally be completed in the days of anti-Christ. Presently, this Plan is affecting, in one way or another, every church here in America, and the world. If you don’t believe this, then you need to listen up and learn precisely what the strategy of this “Plan” is! I want to help raise the alarm and call Christian’s attention to this abomination, so that we might be on our guard, test every teaching we hear in our churches by the light of Scripture, and remain steadfast in our prayer closets, never forgetting for a moment that this is a spiritual warfare! (1). The birth of The Theosophical Society, (2) the theory of evolution according to Charles Darwin, and (3) two books written by H.G. Wells. These all developed and promoted various ideologies that would form the New World Order. (4). Additionally, there came forth Biblical skeptics, liberal scholars that promoted doubt and disbelief in Biblical truth in the eyes of their students; that is, Liberal Christianity, which has infiltrated most of Christendom. “The Theosophical Society was founded in 1875 by Helena Blavatsky and several others. Its objective: the investigation, study and explanation of [occult] phenomena. They “… formed a universal brotherhood of humanity and encouraged students in the study of comparative religion, philosophy, and science; also to investigate the unexplained laws of nature and the [occult] powers latent in man. After Annie Besant, Alice Bailey assumed leadership. Alice Bailey (born June 16th, 1880) in England; raised in an orthodox Christian family which she would say later, made her very unhappy and a bad tempered little girl. The Twentieth Century - In 1917 she moved to the USA, where she was introduced to the teachings of Theosophy. She met, and married, her 2nd husband Foster Bailey (33rd degree Scottish Rite Freemason). Between 1919 and 1949 (the year of her death), she produced twenty-four books (produced by her organization’s own publishing company, Lucis Trust*, originally called the Lucifer Publishing Co). Nineteen of these books were written by her Tibetan Master Djwhal Khul- supposedly, a spirit entity that channeled information through her. Much of the content of these books dealt with "The Plan." Which in turn influenced the birth of many New Age groups (the various schools of the occult were named ‘the New Age movement’ by Alice Bailey herself): The Church Universal and Triumphant, Benjamin Creme's The Tara Center, the Robert Muller Schools and The Temple of Understanding, to name a few. * Today, the Lucis Trust is run through an international Board of Trustees whose membership is populated by an international conspiracy of elitists like the Rockefellers, Kissinger, George Soros and other globalists committed to their new world order government and are members of the Council on Foreign Relations (CFR), the Bilderbergs, and the Trilateral Commission. Most importantly, Lucis Trust influences powerful business CEOs and national leaders throughout the world, providing worldwide financial support for all of Alice Bailey’s New Age groups [World Goodwill, Triangles, Lucis Publishing, Lucis Trust Libraries, and the New Group of World Servers]. It also maintains the UN Meditation Room. The late Robert Muller, the Assistant Secretary-General of the UN was also a mystic and was deeply committed to the teachings of Alice Bailey. He developed a World Core Curriculum based on her philosophy and whose ideologies have already been incorporated into our own American Public School system. Think about that – our Public School’s official philosophy was inspired by demonic spirits! Just as the demonic realm infiltrated the school systems, our society at large was likewise infested by the teachings of Neale Donald Walsh who wrote Conversations with God, Helen Schucman: A Course in Miracles and Barbara Marx Hubbard: The Revelation, and many others who have stated that their New Age ideas were channeled to them by ‘God’ or spirit guides, or ascended masters. Many who practice contemplative prayer are also receiving ‘divine messages’– we will address contemplative prayer and Spiritual Formation Movement later. For more about Walsch, Hubbard, Williamson and Schucman, here is a three part article for your consideration, based on Warren Smith's book False Christ Coming: Does Anybody Care? Part One. These ‘vibrations’ are also what Alice Bailey called “overshadowing” and “psychic impressions” both of which are euphemisms for demonic influence and or possession by those that Bailey referred to as “the ascended masters” or what EPH 6:10 states are Satan’s own “principalities and powers”. “The time must come when . . . the Buddha, the guide and teacher of illumination for millions of the East, and the work of the Christ, Who came as the teacher and savior recognized first by the West, must achieve fusion. There is no . . . conflict in Their teaching. There is no competition between Them. They stand forth as the two greatest world teachers and saviors.” They shall fuse together to form “the world religion” which will serve the World Teacher [anti-Christ]. The Origin of Species by Means of Natural Selection, or The Preservation of Favored Races in the Struggle for Life. Produced in the 19th century and championed in the 20th century, Charles Darwin’s infamous book laid the ground work for acceptance of evolution as scientific (though the idea had already existed in Hinduism for thousands of years, in a physical as well as a spiritual sense). Note in the title “Favored Races” – meaning the strongest, the best of them shall be fittest to survive and flourish. This book all on its own has caused many professing Christians to doubt their faith. If evolution is true, then the Genesis account of creation is false, as is the fall of man into sin – and if these are false, then there is no sin and no need of a Savior. The Bible therefore can and must be abandoned – that is the conclusion of those schooled in Darwinian evolution, both in public and in higher education. For an excellent resource that disproves this awful and scientifically poor theory, check out The Evolution Handbook online! Those in the Theosophical Society believe in evolution and even classified 'root races' from the very basest to the most supreme – those supreme, the most highly evolved, are the adept in the mysteries. Incidentally, there was a very infamous person who was an avid reader and enthusiastic supporter of both Alice Bailey’s books and that of Charles Darwin – Adolf Hitler. Nazism was certainly brimming over in occult beliefs! H.G. Wells, a Fabian Socialist – defined: “one who believes that a shift towards global socialism is inevitable but should be achieved in a gradual, imperceptible manner ('change by erosion') so as to not cause notice or alarm”. Not only a famous novelist of the 19th century of The Invisible Man, and War of the Worlds, but also of non-fiction. It was Mr. Well's wish that this Power Elite of Fabian Socialists would eventually surface and be made known to the world, but the other members were resistant to this idea, which caused a break between Mr. Wells and his comrades; it was later that he published his book The Open Conspiracy: Blueprints to a Global Revolution. And soon after, The New World Order. “I have objected, both in the past and recently, to a few of its policies...but in general my chief difference of opinion is that it wishes to remain unknown, and I believe its role in history is significant enough to be known.” ~ Carroll Quigley, Tragedy and Hope, published 1966. Much of Carroll Quigley's work in this book had to do with what has been known as 'Round Table Societies'. “The political world of the Open Conspiracy must weaken, efface, incorporate and supersede existing governments .... the character of the Open Conspiracy will then be plainly displayed, it will be a world religion [the woman riding the beast] ...The immediate task [is] a planned World State, appearing at a thousand points of light [but]...generations of propaganda and education may have to precede it. Wells wrote a second book pub. in 1940, entitled, The New World Order). Both phrases “thousand points of light” and “new world order” were used by former President George Bush Sr. in his congressional address prior to the Persian Gulf War in 1991. Bush Sr. and Jr. are members of Skull and Bones, aka the Bavarian Illuminati. Man’s ideas have evolved upward from the primitive to the complex. And so, the religious liberal says, our ideas of God have also evolved and are continuing to evolve. Religious change is the evolution of ideas, part of the natural order and survival of the fittest. Hence, there is no sin of violation of God’s law. To the liberal theologian, sin is only lack of maturity, a lack of proper evolution. The answer to sin is not redemption in Jesus Christ, but education, man directing and controlling his own evolution. These Schools of Higher Criticism (of the Scriptures), were dominated by rationalists (Modernists), liberal theologians and those who doubted, even disparaged the truth of the Bible. They influenced the church with their views and have done a rather complete job: once reputable seminaries and universities: Harvard, Yale, Princeton, Oxford, founded upon God’s Word, have since gone liberal, adopting a less than literal view of the infallible, inerrant Scriptures. The Christian denominations are all but dead spiritually. For a concise explanation of Modernism vs. Post-Modernism, go here. It was about this time when most of our modern translations began to spring up, with increasing deterioration to God’s Word. So the darkness encroaches deeper and deeper into all aspects of our society . . .
It’s easy to see where the Emergent Church Movement gets its ideology from. Being devoted to the ‘evolvement’ of Christianity means that improvements independent of the Bible are not only possible, but also are progressive and good! Doctrines and beliefs established by Emergent authors, they believe, are superior to those written by prophets and apostles of the Bible, because they are more ‘spiritually evolved’ than those prophets and apostles that lived thousands of years ago. 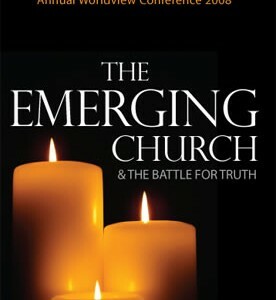 So What Is The Emergent Church?? Breaking it down simply: they see the Bible as inspired of God only in a general sense, and that God’s Word continues to be revealed in the telling of stories today in the same way that stories were shared by the writers of the Bible and in shared spiritual experiences. They question the idea of absolute truth and renounce any that believe in such, revealed in Scripture as being arrogant, biased, and unlearned. They have a low view of the Bible. Emergent Followers also place a high priority on experiential spirituality that involves mystical practices (we’ll address this soon). They like the idea of their meeting rooms or sanctuaries having candles, incense, statues (icons), making the sign of the cross over themselves, low lit environment, even stations of the Cross. Some place meditation labyrinths just outside of their buildings for people to walk through. They have a desire for a more sensual religious experience rather than teachings from the Word of God. The Emergent Church will chaff at the idea of JOHN 14:6; rather, they will talk about ‘the way of Jesus’ which is not just for Christians, but for Buddhists and Muslims too, without their having to leave their own religion! “...my mother, a convert to Evangelical Christianity. . . hoped I would have one of those dramatic ‘born again’ experiences. That was the way she had come into a personal relationship with Christ. . . But it never worked for me. It took me quite some time to realize that entering into a personal relationship with Christ does not always happen that way (JOHN 3:3,5; 1 PET 1:23). “What if tomorrow someone digs up definitive proof that Jesus had a real, earthly, biological father named Larry, and archeologists find Larry’s tomb and do DNA samples and prove beyond a shadow of a doubt that the virgin birth was just [a myth] the Gospel writers threw in …Could you still be a Christian? Is the way of Jesus still the best possible way to live?” ~ Rob Bell, Velvet Elvis, pg. 26-27. Rob Bell wrote a book recently that, regardless of his denials, demonstrates his view of Universalism - the book is called Love Wins; here is a Biblical treatment of that work. Emergent folk are agreeable with calling Jesus, Master or Teacher, Leader or even ‘Coach’ but seldom or never as LORD or GOD made flesh! Rick Warren was actually laying ground work for the emerging church’s new reformation, a reformation that rejects thinking about the return of Christ and works more at convincing the multitudes that Christ is already in them as a global Christ-consciousness - a term used by New Age Spiritualists that adheres to the belief that the 'Christ-Spirit' once indwelt Jesus of Nazareth, but departed from Him at His death on the cross, but may indwell all who are open to it, and that this Christ-Spirit will be most powerfully manifested in the World Teacher who is to come (the Anti-christ). Rick Warren also happens to be a member of the CFR, whose mission is world government. He got his teachings in part from Robert Schuller, who got his from Norman Vincent Peale, who got his from Florence Scovel Shinn, an occultist. "Our words aren't absolutes. Only God is absolute, and God has no intention of sharing this absoluteness with anything, especially words that people have come with to talk about Him. "Let's make a group decision to drop once and for all the ‘Bible-as-Owner's-Manual’ metaphor. It's terrible. It really is. See also this excellent article from LET US REASON on Rob Bell's Universalist beliefs. They believe that the establishment of the Kingdom of God must be accomplished by the church – to find cures for diseases, to ensure social justice (Socialism) for all, the educate the needy, to feed the poor, etc., etc. [Rick Warren’s PEACE plan (PHIL 3:19-20 “[they] mind earthly things” vs. “our conversation is in heaven”)]. Only when we fulfill these objectives of ‘the Gospel’ – will Christ come back; and there are some Emergent leaders who will even argue that point! Biblical narrative and truth, in the minds of Emergent Church folk, is reduced to mere story and becomes uncertain . . . due to continual religious evolution and makes the discovery of absolute truth impossible and always beyond reach. It’s vital for all of us that love the LORD Jesus Christ, that we earnestly contend for the faith, that we stand up for righteousness, that we not compromise the Word that's been entrusted to us, that we do indeed genuinely love the sinner, hate the sin (not the other way around as some might practice), and to faithfully herald the gospel that our LORD commissioned us with. To find out whether or not the fellowship that you attend is drifting towards Emergent thinking, look at these signs that may indicate that the emergent church is influencing it. No doubt that these post-modernist Emergent Leaders see us Biblical Christians as quaint, old-fashioned, out-dated relics, but to the LORD God, we are His holy priesthood, His beloved children, citizens of His eternal Kingdom!